I am haunted by my unfinished works. Every once in awhile, I take out one of those novels I started years ago and never quite finished. Or I finished it but…there’s always a but. It still needed work. It got rejected and I gave up on it. I got tired of rewriting it and started something new. I never threw anything away. If I wrote it it must be brilliant. If not brilliant, eventually fixable. I’ve proved this to myself twice and sold manuscripts I started ten years earlier. Lately White Roses in Winter has been haunting me. A hundred years ago an editor told me it was less of a romance and more of a coming-of-age story and so not right for their line of category romances. Kerrie and Jason. She’s a sheltered rich girl getting her first taste of freedom. He’s a guy from the poor side of town. They meet at a weekend beach bash. When she tells her father she’s pregnant he suggests abortion as the simplest solution. She’s never stood up to her father before, daddy’s girl that she is, but she stands up to him this time. Daddy decides to apply some tough love. She made her bed. He’ll see to it that she lies in it. With the father of the baby she won’t give up. Shotgun weddings don’t happen so much these days. I admit I have some old-fashioned ideas and some soap opera-ish concepts, but I lay awake at night and wonder if I can sell this story in today’s marketplace. If not I can self-publish it. An editor doesn’t have to love it, only the readers. It doesn’t exactly qualify as YA or “new age.” But so what? It’s filled with the kind of drama teen girls seem to love. Misunderstandings and regrets. Kerrie’s jealous friend and a fight. Kerrie takes a tumble down some stairs and her parents accuse Jason of abuse. They whisk her away to a clinic where he can’t find her. (Do I hear Days of Our Lives calling?) Jason’s computer hacker friend helps him locate Kerrie. Later the jealous friend kidnaps the baby. In the end, of course, love conquers all. I always loved the title.I dream of the cover design. White Roses in Winter. Just wait. As soon as I’m done with the other three things I’m working on, I’m going to pull that box out from under the bed and take a look. Read through those old pages and ask that frightening question. Can this manuscript be saved? babies, barbara meyers, novels, YA. Bookmark. good luck! I’m sure it can be! Thanks for the encouragement. 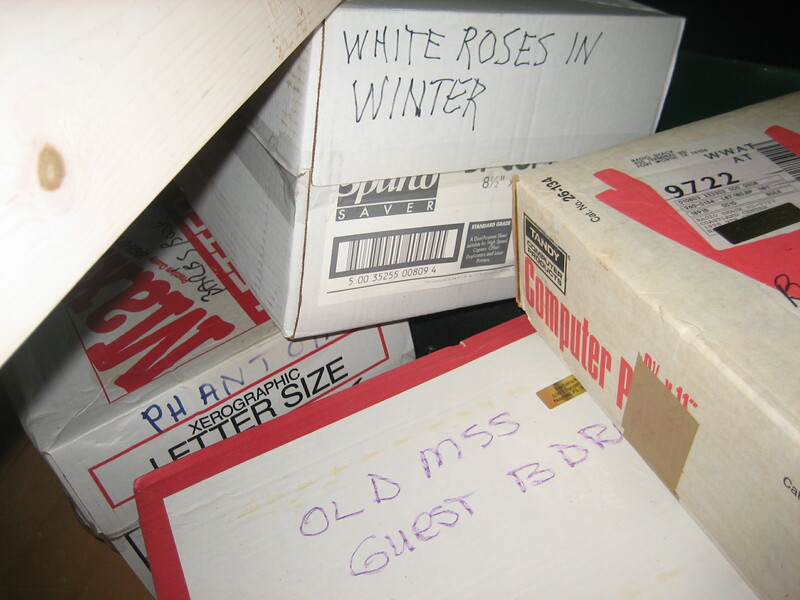 I started reading through WHITE ROSES IN WINTER. It’ll need a lot of updating, that’s for sure!